Press “Read” on “Article”. You have been eaten by a Grue. Thimbleweed Park is a delightfully meta homage to the classic LucasArts and Sierra adventure games. It’s packed with references to games such as Maniac Mansion, Maniac Mansion II: Day of the Tentacle and the Monkey Island series, and its graphics and general control scheme are very similar, especially to Maniac Mansion and its sequel. In classic 1990’s style, two FBI agents are called to a small town with a dark secret, charged with solving a mysterious murder. They meet the quirky townsfolk, start finding clues and you can probably piece the rest of the story together but in summary, wacky shenanigans ensue. Thimbleweed Park sets out mainly to make loving jokes about an underappreciated and mostly dead genre, and it does a bang-up job. As someone who played very little of the genre as a wee lad (with the notable exception of Shadowgate), the jokes range from being easy to understand, even for someone with only a little background knowledge, to clearly referencing something that I didn’t understand. The gameplay falls prey to the exact same problems as the original genre, which is a lack of any contextual awareness. It stands to reason that if I click on a door, I want to open it, not eat it, and yet the game demands I jump through its hoops every time I want to do a simple action. For all its flaws, Zojoi’s Shadowgate remake did a fantastic job with this. If you fail to specify an action, it takes the most obvious option and runs with that. Thimbleweed Park desperately needed this level of awareness about general quality of life changes to the original format. That said, when remaking a game like this, it’s often important to leave the errors in. The best example of this was the reaction to Yooka-Laylee when it released. It was marketed as a return to ’90s-era 3D platformers, and much like Thimbleweed Park, it took a ‘lovingly mocking’ tone with the source material. When it released to much anticipation, the release was lukewarm at best, while I personally loved it. Complaints about camera issues, poor navigation and incredibly easy sequence breaking were everywhere, but those are the things I signed up for when I bought it. A ’90s-era 3D platformer without camera issues and overpowered late game moves isn’t a ’90s-era 3D platformer at all, it’s little more than a cheap knockoff. You can’t expect an authentic nostalgia trip if you don’t want all the flaws that came with the original, and that’s the fundamental problem with any retro-esque game. When we remember the old games that we used to love, we remember around the problematic parts; we focus on the bright, vibrant worlds and the thrilling storyline, and we conveniently forget the insanely difficult sidequests and the far-too-long tutorial, because that breaks the rose-coloured glasses that we look at them with. The second a game comes out that markets itself based on that nostalgia, the illusion shatters before our eyes and everything we didn’t like comes flooding back, only this time we didn’t expect it and it feels like a betrayal. We wanted the good elements of history with none of the bad, but to the detriment of hopeful time travellers everywhere, that’s not how time works at all. 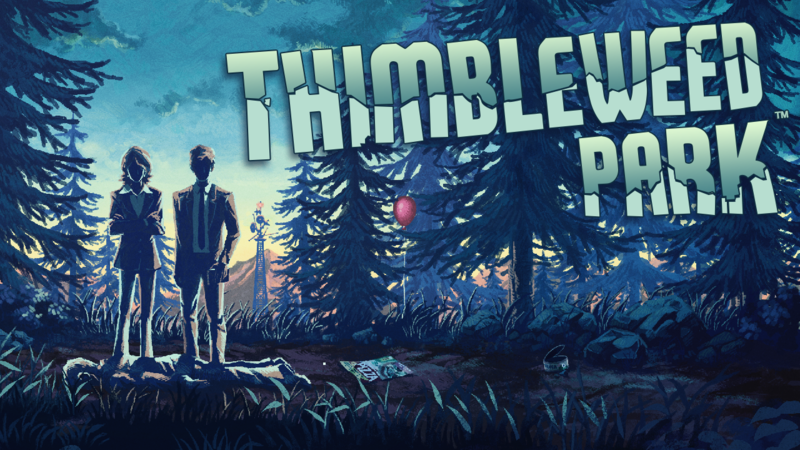 Thimbleweed Park delivers exactly what it promises on the box, and that won’t be for everyone. If you know what you’re getting into, I’m sure you’ll have a great time with it, but if not, you’ll find it damn near unplayable. Unless you’re buying one of these fine leather jackets, I have a bizarre craving for black coffee and cherry pie.